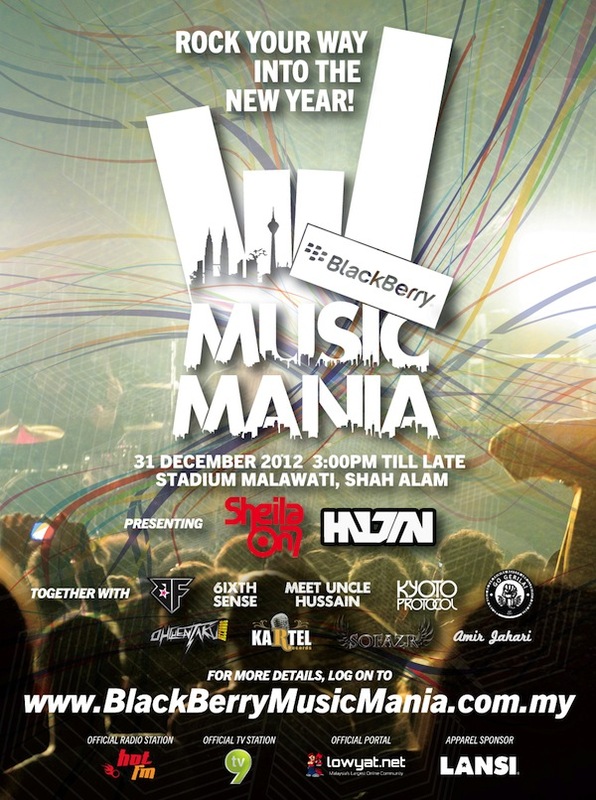 Rock Out This New Year’s Eve With The BlackBerry Music Mania Concert & Carnival! Get ready to end the year with a bang as Research In Motion unveils the BlackBerry Music Mania Concert and Carnival set for the 31st of December at Stadium Malawati, Shah Alam. Headlining the concert are Indonesian rock legends, Sheila On 7 supported by local rock heavyweights Hujan, Bunkface & Kyoto Protocol as well as the country’s foremost hip-hop family Kartel. Completing the lineup we have local stars Oh! Chentaku, Sofazr, Meet Uncle Hussain, 6th Sense, GoGerilla! and Amir Jahari all in on amazing concert to usher in the new year. Apart from featuring a stellar cast of award-winning and chart-topping bands and artistes, the BlackBerry Music Mania will also feature a carnival running concurrently with the concert at the outdoor area of Stadium Malawati. Besides a wide array of F&B options and bazaar vendors, visitors will also be treated to high flying BMX stunt performances and graffiti demonstrations by the award-winning WAKAKA Crew. The diverse street crew will also be running a Breakdance and BMX / flatland trick-cycling competition and performances to keep your adrenaline level on high throughout the day. An outdoor indie stage completes the carnival offerings, where an exciting lineup of upcoming talent such as Amir Jahari is scheduled to charm your afternoon with their melodious tunes. Entry to the carnival is free of charge while the concert will require a ticket. How do you score one of these awesome tickets you may ask? Head on down to http://blackberrymusicmania.com.my/ and find out! Lowyat.NET is the official portal for The BlackBerry Music Mania Concert & Carnival and we will be giving away tickets to the event as well as limited edition concert tees from the amazing guys at The Swagger Salon! Keep it right here at Lowyat.NET and our Twitter and Facebook for more info on how you can win those goodies in a few days!